You see the signpost for North Colony Road and take the right-hand turn leading you off the well-beaten path that is State Route-5. The urban trappings around you quickly fall way as the road leads you down a decidedly less traversed path. You pass through the four-way stop and see the large grass field immediately on your right. It's quarter-to-six and the sun is still in the sky, but the field has already begun to fill up with cars and small groups of people. You park alongside the trees lining the field and exit the car. Despite your knowledge that the city is but a mile down the road, you feel as though you could be in the middle of nowhere. A paranoid sense of isolation slowly begins to invade your thoughts. The sun is setting fast and you start off down the old, uneven road, following the crowd as you make your way towards the entrance. 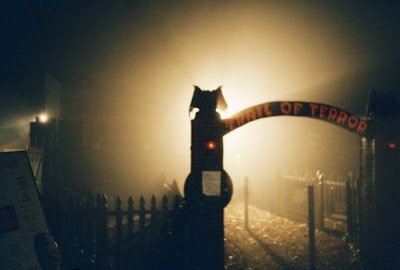 The Trail of Terror is a popular New England haunt that opens within the confines of the Polish National Alliance Park in Wallingford, Connecticut. 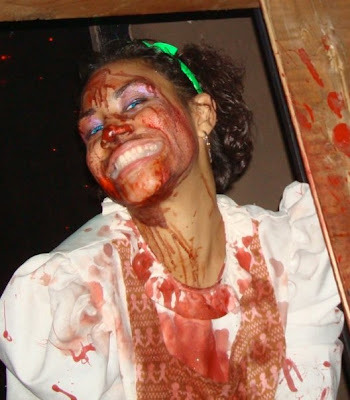 It was once voted as the "Best Outdoor Attraction" by Fright Times magazine and was ranked by Haunt World magazine as the number 2 "Best Charity Attraction" in 2008. The venue is a highly complex, haunted maze-like walk comprised of numerous twists and turns. When you first arrive you have to pick which line to enter, depending on what kind of tickets you wish to purchase. For those of you whom choose to wait in the general admission line, the snaking, roped off corridors are dotted with mood setting props and some large and imposing animatronic figures. The lines pass by Big Dan's Trail Grub (a concession stand that is accessible without losing your place in line) and eventually wrap back toward the creepy old building that serves as the entrance way into the haunt proper. Distractions from your wait are provided for by appropriate heavy metal music and a highlight reel of horror movies playing on a nearby movie screen. Additionally, costumed actors will periodically make their presence known as frantic screams punctuate their path through the crowd. The in-line entertainment does not end there as, over the course of the night, several different skits will play out along the rooftops of the buidling standing at the Trail's entrance. Given that the wait in line is typically long, these efforts to keep the crowd entertained are greatly appreciated. 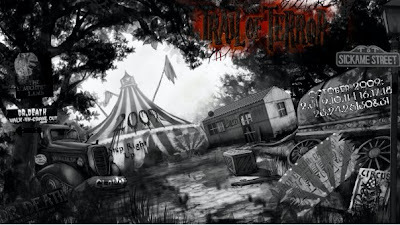 Once you finally progress into the trail proper, different scenes and set pieces meld and flow into one another, with a total of thirty different themed locales being represented in the 2009 season haunt. Not content to just present the usual rogues gallery, although demonic clowns and inbred hillbillies are present and accounted for, the Trail reaches out and includes more obscure horror fare as well. For example, one scene had been made up to look like old-time England and whose shadowy corners were populated by coughing, hacking, wheezing plague victims. Another scenario, this one returning from the year before, featured a strung up Santa Claus and a delightfully demented Mrs. Claus whom has apparently decided that she prefers the company of elfs. Dark parodies of Sesame Street and Alice in Wonderland help round out the cards with skits that one doesn't normally think of as being haunt material. I'm happy to say that in my experience they all came off as equally spooky and enjoyable, from the Cage Maze psychopaths to the girl with the human pin cushion skills just outside the entrance to the Freak Show. The quality of the set pieces at the Trail of Terror is generally top notch. If you can find the time to stop and smell the roses, you'll see a lot of fine detail and craftsmanship has gone into your surroundings. The demonic clowns for instance are centered around a circus tent that, from the outside, is even complete with a lite-up, rotating top. The faux-rock walls used for Jason's Cave and the Mine Shack in this years haunt look very much like the real thing at first glance. High quality set pieces are especially important when you wander between so many differently themed spooky realms. The quality helps to immediately place you in the scene and help manifest the proper atmosphere for each sub-story being told. If I had any complaints with the Trail of Terror this year it would be that some of the set pieces and costumes are recognizable as store bought items that one might find in any well stocked Halloween warehouse. I'd like to stress that this is a fairly petty and minor complaint when one considers the number of different scenes contained within the Trail of Terror and its approximate 45-minute walk-through time. For a haunt as big as this one, you simply need lots of props and actors to fill all of that space. Given that this is so, it is understandable that not every piece on display is a one of a kind item. That said, there are plenty of unique props, many large and elaborate sets, and some fantastic make-up jobs on display. Clearly many people with great passion and skill have worked long and hard to deliver this level of quality to the haunt's customers. The level of interaction included in the Trail's skits is one of the largest and most welcome differences between the Trail of Terror and many of the other haunts I've been to. Interaction can come in the obvious form, with actors talking and reacting to you depending on how you respond. My girlfriend, for instance, was singled out by the deranged Mrs. Claus and berated when I gave away that she didn't celebrate Christmas. For this slight, my girlfriend was separated from the small group we were in and forced into the oven first. This brings me to the next form of interaction present at the trail, that of physical engagement. At times you will have to duck down under a miniature door to enter into Wonderland, crawl through ovens, and even slide down a ramp leading to the bottom of a certain spooky well. The ground along the trail is frequently uneven and given that many of the floors are man-made, this is clearly by design. They want you moving at a certain pace and they want to keep you off-balance, both mentally and physically. Along these same lines, several scenes at the Trail of Terror generate their thrills by exploiting your basic senses. The Vortex Tunnel, a haunt-staple involving a walkway crossing the center of a rotating outer shell of a room, makes an appearance along the Trail. The sensations of movement and vertigo that this simple yet clever device is able to trick your mind into producing never ceases to amaze me. Another room utilizes strobe lights and walls covered in a polka dot pattern, creating an optical illusion that prevents you from being able to distinguish the dotted actors from the walls as long as they remain motionless. Other sections of the Trail with similar themes are perhaps less creative yet no less effective. One section requires you to continue onward through the haunt in near-complete darkness, using only your hands to feel your way forward. I find that these scenes aimed at exploiting your senses are not only very effective at unsettling you, but also serve to incite fear within the primal-most sections of your mind. If you cannot trust your senses, your sight and balance, then how can you be actively preparing yourself in anticipation of the next scare. The Trail of Terror's commitment to this approach to fright is rather unique amongst the haunts I've attended. They're really trying to push you out of your comfort zone, a desire that led to the most entertaining and interesting part of my evening. I should probably warn you now that some spoilers regarding the scene at the end of the Trail lay ahead. As my girlfriend and I approached the final scene, that of a basement morgue, with her clinging to my arm in what no doubt would be interpreted as a death grip, an actor managed to disarm her with a simple and friendly greeting. Perhaps forgetting herself, my girlfriend loosened her grip as the actor directed her, and seemingly our entire group, towards an open door directly in front of us. I noticed that there were a couple other actresses in the room and, oddly, only one other petrified-looking female patron. My girlfriend stepped into the room and the actor deftly slid his body into the door frame, blocking me from immediately following. "Not you!" he snarled at me, quickly fading into the room and closing the door behind him. As the door was swinging shut, I could see my girlfriend begin to turn around, her eyes widening as she realized I was no longer at her side. The door shut and we were separated. Immediately, a previously unnoticed door to my left slid open. A blood splattered female orderly steps out, urging our group onward into the basement. I pause, my eyes still on the door behind which my girlfriend had disappeared. I wasn't sure what to do. Should I wait here or should I go on? The orderly clearly could see my hesitation. "Don't worry. You'll get her back," she whispers to me with a cackle. Powerless to do anything else, I obey and proceed into the morgue. And that's how I felt walking through the entire last scene; unsure, powerless, and perhaps even a little afraid. Not that any harm was going to befall my girlfriend, certainly not, but I didn't know how she would react in a haunt off by herself. What if she were to freeze up? Or double back looking for me? At this point I didn't actually know we were near the end of the haunt and didn't know when or where along the path we would be reunited, if at all! Part of my fear was real; I couldn't remember if she had been carrying her cellphone. How would we find each other in the crowd? This was not just another jump scare; I was definitely outside of my comfort zone in a way that I think was quite intentional. Congratulations, Trail of Terror, you managed to scare me. I suppose to provide closure on the story I should inform you that although we were separated and I had those countless worries running through my head, my girlfriend and I were reunited rather quickly as the morgue was the final scene of the walk. Turns out, while I had to crawl through a mock morgue freezer, she had been selected to take an alternative path. She and this other patron I had briefly seen were coaxed into laying down on an actual stainless steel gurney and passed into what she describes as a real-life morgue unit. As she lay there entombed in utter darkness, loud banging reverberating through the steel, the gurney was slid on a track leading through the wall and she was eventually released on the other side. What amazes me most about this branching path is that if my girlfriend hadn't been randomly selected to traverse it, I'd have never even known it existed. Before I wrap up, I feel I must make mention of my one negative experience with the Trail of Terror. Allow me to preface this by saying I've personally attended this haunt every year for the last four years and, with the sole exception of last year, have always been impressed with their annual offering. On this particular night last year, I found that certain scenes contained too many actors while other sections felt too scarcely populated, and not in a deliberate way. Due to the sheer size of the haunt and the volunteer nature of its staff, it seems as though coverage can fluctuate a fair deal over the course of October. I assume that the root of this problem may stem from specific issues that only affected the one particular night on which I attended last year. However, since the quality of the haunt potentially may differ from night to night, your experience may differ from mine. That warning said, I was extremely pleased by my experience this year and you can bet that I will be back again in 2010. 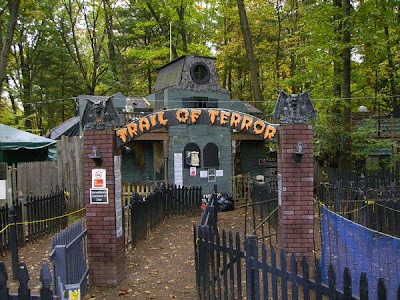 For my money, the Trail of Terror remains the single best haunted attraction in Connecticut. Great job to all involved! 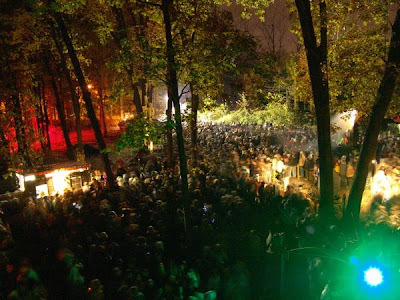 The Trail of Terror is an elaborate and fun haunted walk that people come from all around New England to see. Proceeds from ticket sales ($10 General Admission, $20 Speed Pass) are donated to charity, which in the past has benefited the Red Cross. However, due to the recent closure of their local Red Cross branch, a different charity will be receiving proceeds from the 2009 haunt. The Trail closes at 11PM on Friday and Saturdays nights and closes at 10PM on Sunday nights. The attraction is immensely popular so you should either buy Speed Pass tickets online on their website or prepare yourself for a two to three hour wait in the normal ticket line. Over the past four years I've found it doesn't really matter when you get there, either before or after the gates open, as you'll spend approximately the same amount of time in line regardless. If you aren't buying tickets ahead of time, I wouldn't recommend arriving any later than 7 o'clock. Tickets can and frequently do sell out, so it is recommended that you arrive early. If you enjoyed this review, may I recommend checking out my review of Haunted Overload 2008, the number 4 haunt in the nation as determined by Haunt World Magazine! As always, please click on an ad and join my Facebook fanpage to show your support for the Geek!